There are so many fantastic foodie events in the North-East, and we are definitely going to blog about them more as we think everyone should appreciate the fantastic home-grown/made/baked food we have in our region. So with no further ado, we introduce you to the first (of a series) of blog posts all about foodie events happening over the summer months in the North-East! Fenwick Farmers Market is on from the 18th – 20th July in Fenwick Food Hall and is a collaboration between Fenwick and TASTECLUB where there will be a great selection of the finest local businesses’ produce. Choose from sweet and savoury, with delicious samples to taste. There also will be a choice of gluten free produce and ice-cream. I really like how gluten-free produce is on the rise, as it really can be difficult (or really expensive) to get a hold of. I don’t have a gluten intolerance, but a close person in my family does, so I will definitely be checking out Gluten Free Kitchen‘s produce to see what they have on offer! As well as this event, Fenwick Food Hall is a great place to visit at any time as they stock over 30 different producers’/suppliers’ local products and have such interesting and delicious produce on offer: from their flours, cheeses, coffees, teas, ice- creams, meats and eggs, to cakes, honey, preserves and sticky toffee puddings! I know it comes across as a pricier option for food shopping, but believe me when I say that there has been more than one occasion when I’ve found a product for cheaper in Fenwick Food hall then from Asda! I don’t know how that happened, but it did! Also, it is always money definitely well spent for the quality and the conscience you have afterwards from helping another local business to thrive. Also, a fun Fenwick fact for you: on the roof of Fenwick department store there are bee hives. With bee-keepers tending to the hives and collecting the honey made from these bees to sell in the Food Hall. How is that for local produce! 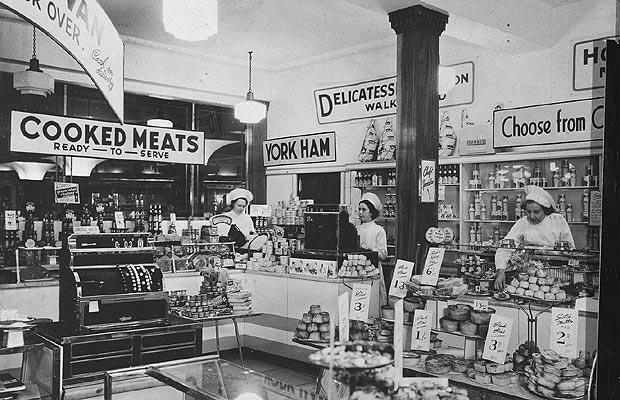 Also, I love this picture I found on the Telegraph website showing what Fenwick Food Hall used to look like in the 1950’s, as although it doesn’t look like that today, it still has the same vibe. Really, Fenwick is just one big market of the best local produce around. And if you have never been to their Food Hall before, then go to the Fenwick Farmers Market and see what all the fuss is about. Fenwick department store is found on Northumberland Street. The Food Hall is on the Ground Floor.